Tag Archive | "Three Lined Rasbora"
The Scissortail Rasbora (Rasbora trilineata) is native to the Chao Phraya and lower Mekong river basins in Laos, Thailand and Cambodia and throughout the Malaysia Peninsula. It is also widely distributed throughout the Greater Sunda Islands of Sumatra and western parts of Borneo including the Malaysian state of Sarawak and Indonesian province of West Kalimantan. 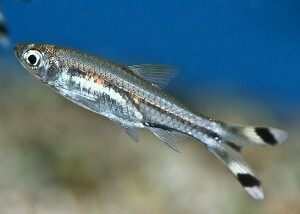 Scissortail Rasboras are a popular species also known as the “Three Lined Rasbora” by tropical fish keeping enthusiasts. 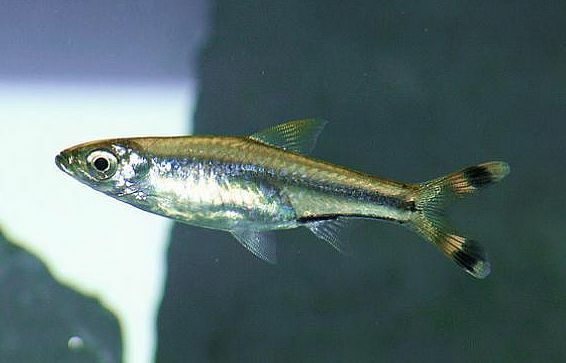 The Scissortail Rasbora has a silver iridescence that shimmers and sparkles as light reflects off the fish. The name “scissortail” is derived from the characteristic twitching motion of the deeply forked caudal fin (that resemble an open pair of scissors) when the fish is resting. The distinct bar pattern on their caudal fin accentuates the scissor like shape. The Scissortail (Rasbora trilineata) differs from R. caudimaculata by the lack of red coloration in the caudal fin, and from R. spilocerca by its much larger size. Some of the wild populations have yellow pigmentation of varying degrees in their caudal fins. Scissortail Rasboras are extremely adaptable. They have been found in swift flowing boulder strewn streams with sand or gravel bottoms, as well as in the more sluggish black waters of old peat swamp forests loaded with branches, twigs and decomposing leaves. They can happily live in the clear waters of streams with a pH of 6.5 to 7.5 as well as the canopy covered tannin stained waters with a pH of 4.0 to 6.0. During the rainy seasons, they move into flooded areas, lakes and reservoirs. Scissortail Rasboras are peaceful schooling fish that make them ideal for larger well planted community tanks. They can be housed with many other popular fish such as rainbowfish, livebearers, tetras, other cyprinids, anabantoids, catfish and loaches. They require no special water chemistry but do need to be kept in small schools of at least 6 to 8 specimens. Scissortail Rasboras should be kept in a large densely planted aquarium with a lot of swimming space. Ideally, it should resemble a flowing river with a substrate of variably sized gravel and small rocks along with a few river rock boulders. A power head or two should be added to create the needed water movement. Driftwood branches and some Java Moss , Java Fern , and/or Cryptocoryhnes can be added for cover and aesthetic value. Scissortail Rasboras are surface dwellers and accomplished jumpers. They need a tight fitting tank cover to prevent them from escaping. They also are sensitive to the accumulation of organic waste and need a good filtration system to thrive. Scissortails are easy to breed and like most cyprinids, they are egg scatterers. When in condition they will continuously spawn in a densely planted, gravel bottom aquarium and require not special attention. The parents will eat their eggs so if you plan to keep more of the hatch, remove the parents a couple of days after spawning, switch off the power filter and replace it with a matured sponge type unit. This stops the fry from being sucked up into the filtration unit. Eggs will normally hatch with 18 to 48 hours and the fry will be free swimming 24 to 48 hours later. until they are able to eat flake foods, freeze dried bloodworms and tubifex . Scissortail Rasboras are usually 2″ to 2-1/2″ long when available for purchase.